Buying a used car can be hard. Scammers are everywhere. Make sure to research the vehicle’s history. There are several ways to get a report. You can either lookup by license plate or by VIN. For vehicles registered in the state of California, you can run a free California license plate lookup to get everything you need to know about the vehicle. Vehicle owners must register their vehicles with the State DMV. Most transactions can be completed online to skip the line. Make sure to check online first before heading to your local DMV. License plates are required for most vehicles. You will get license plates when you register your vehicle. Vehicles must have license plates with valid date stickers. This shows that the registration is up to date. The local DMV will conduct a vehicle verification. They will check the vehicle identification number. This is to ensure the legality of your vehicle. Contact your local DMV to schedule an appointment. Below are the documents you need to transfer the title in your name. The vehicle title must bear the signatures of the owners and lienholder related information, if applicable. The vehicle title, signed by the owner and lienholders, if any. Odometer disclosure, if less than 10 years old. A completed Notice of Transfer and Release of Liability (Form REG 138). A completed Statement of Facts (REG 256). If the vehicle is part of an inheritance, an Affidavit for Transfer without Probate (Form REG 5). How to Register a Vehicle in California? For privately owned: Completed Application for Title or Registration form. Must bear the signatures of the owners and lienholder related information. For commercial: Completed Declaration of Gross Vehicle Weight/Combined Gross Vehicle Weight form. For trailers: Completed Permanent Trailer Identification (PTI) Application Certification form. The dealership will take care of the registration when you purchase from them. They will also issue a temporary registration for your use. You will receive the permanent registration card and stickers in the mail. If you will not receive your documents in the mail, contact your local DMV office. After purchasing the vehicle, you have 10 days to register it. Here are the requirements for vehicles purchased from a private party. Vehicle title or Application for Duplicate or Paperless Title (REG 227) if the title is lost. Signature(s) of seller(s) and lienholder, if any, on the Certificate of Title. Signature(s) of buyer(s) on the Certificate of Title. Odometer disclosure for vehicles less than 10 years old. There are eight (8) types of plate available for issuance in California. Depending on the particular plate that you will choose, requirements may differ. Generally, you can transfer a license plate from one vehicle to another that you own. For further inquiries, read the FAQs section of How To: Change Vehicle Ownership (HTVR 32). Contact the DMV near you for more information! Buying a used car in California? Don’t make a costly mistake. Run a Free License Plate Lookup on your vehicle! Check for accidents. Every year, millions of automobile accidents are reported. Check for title brands. Flood, hail-damage, and salvage titles. These are examples of critical title brands. Check for special purpose designations. This includes taxi-use, rental-use, or police-use. Uncover the full-story of your California-registered vehicle in seconds! 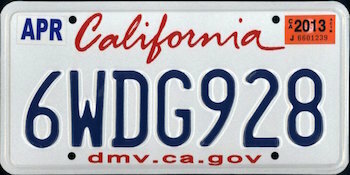 Run a Free California License Plate Lookup now!